With every season, a gift; to every season, a sacrifice. This year's studio theme has been "Make Do & Mend"--that is to say, using what I have as much as possible before buying new materials. As it turns out, I had quite a bit stored away in odd places, including a few masonite boards. This board's attempted first painting was going to be "Canary in a Coal Mine," with the central figure wearing a gas mask, flowers blooming atop her flowing hair. Once I decided that the idea was not original enough (so many "Canary in a Coal Mine" paintings already exist--thanks, Google) and honestly not that good, I set it aside. At this point, I had filled in the background fade, flower base color, outlined the birds, and all but finished the gas mask. That was at least two years ago. 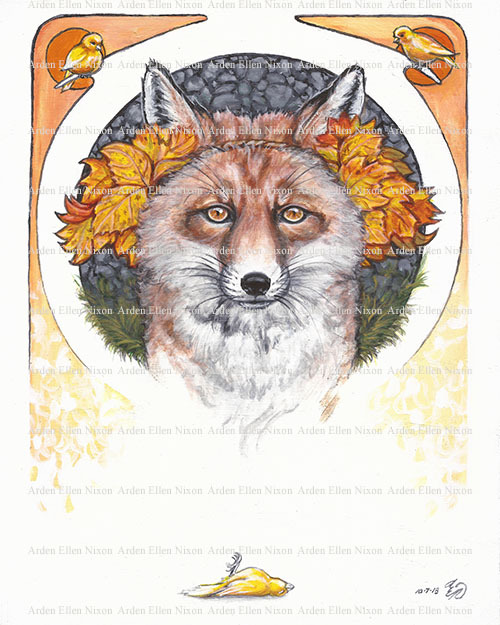 Upon rediscovering the board and looking at it again with fresh eyes, I saw a red fox wearing a leaf crown, marking the change in seasons. The canaries obviously stayed, though their quality definitely received an upgrade!